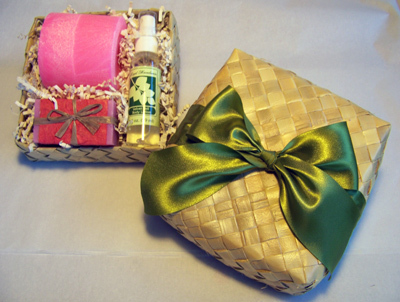 Aloha Spa Gift Set - $46.95 : Soap Box Hawaii | Purveyors Of Fine Handcrafted Soap, All natural quality hand made. Treat that special someone (or yourself!) 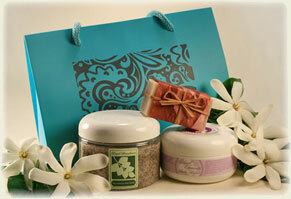 to three of our lovely products encased in a classy “purse” box in azure blue with silver trim. 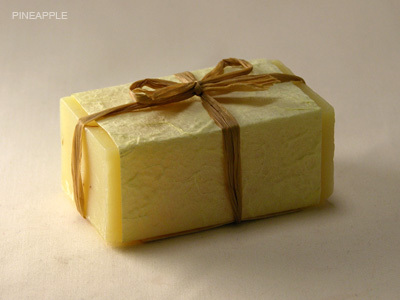 All products are Made in Hawaii: one Royal Macadamia Body Scrub, one Royal Macadamia Body Butter (choose White Ginger, CocoMango or Macadamia Nut; subject to availability), one regular bar soap (choose from 6 different scents; subject to availability). These treats will bring Hawaii to you! Flowers not included.